Adrian Fanjoy and myself been doing performance testing of SOLIDWORKS for almost too many years to count and we have presented those results at SOLIDWORKS World each year as we have continued to refine our tests each year. So as SOLIDWORKS World 2016 is fast approaching I thought it would be good to review some of our results from our last round of testing for SOLIDWORKS World 2015. Last year we looked at how an optimized and correctly configured workstation allows for faster design iterations, improved productivity, greater creativity and more innovation for SOLIDWORKS users and their employers. As in years past we partnered with BOXX Technologies who lent us one of their top of the line APEXX 2 CAD Workstations which allowed us to put together a large range of different test variables. 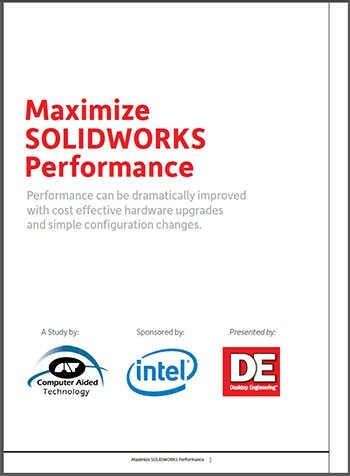 After all our testing and presentations were done we would worked with Intel and the team at Desktop Engineering to turn our Achieving Extreme SOLIDWORKS Performance presentation into a white paper. The link below will take you to our site where you can download the Maximize SOLIDWORKS Performance White Paper. To see our latest presentation, Achieving Extreme SOLIDWORKS Performance: Modeling Methodology you can find us in Dallas, TX at SOLIDWORKS World 2016 on Tuesday, Feb 2nd at 1:30pm.